World Trade Center opens up the box office weekend a couple of days early, with the mass appeal of its extremely touchy subject matter serving as this frame's biggest question mark. The incidents of September 11th, 2001 linger strongly in the minds of well, basically everyone still around, making the entertainment prospects of a retelling of that day's events more than a little dubious. This spring's United 93, which covered the events of the only plane to miss the hijackers' target that day, was filmed in a quasi-documentary style. That was probably the best tactic for the first mass-marketed Hollywood produced film about the attacks. Oliver Stone, the director of World Trade Center, takes something of a sideways view of the day, focusing not so much on the attacks and their mechanics, but rather from the perspective of two of the rescue workers trapped under the buildings and eventually rescued (I'm really hoping that you're not shocked at this reveal). 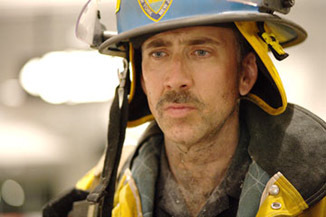 Nicolas Cage and Michael Pena star as the two stranded Port Authority police officers, following them as they enter the buildings after they're hit, but unfortunately for them just before they collapse. The film then goes into the rescue efforts to look for survivors, as well as how families and loved ones dealt with the day's events. It positions itself as a portrayal of heroes on that day.